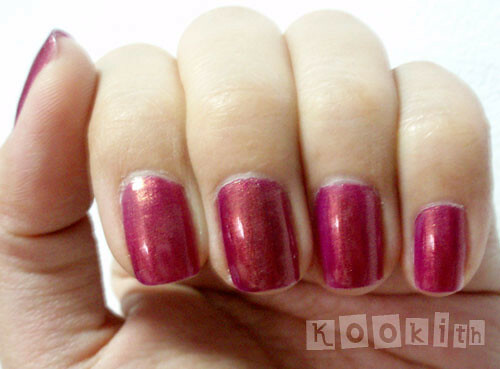 A metallic nail polish from Zoya’s Flourish collection. Zoya Nail Polish in Shivon can be best described as: A dark rose gold with hints of purple and bronze and strong gold duochrome shimmer. This color flickers and changes with light and movement so you’ll never be bored. With flash. 3 coats of Shivon on middle fingernail. 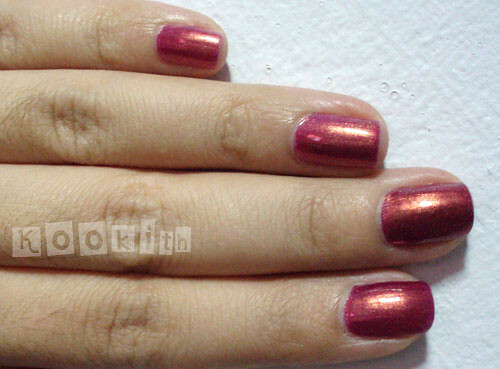 In person, Shivon is a pinkish mulberry with plenty of gold shimmer. The website described this shade as a cool-toned colour, but on me, it was definitely warm. I think this could be due to the gold shimmer. Sadly, this wasn’t a winner in my book. I didn’t really see much purple or bronze, and there were strong hints of pink in it. The formula pretty much sucked too. It was gloopy and the more I tried to fix the application, the worse it was. The reason I was drooling over Shivon for so long was because I’d seen some gorgeous swatches that blew me away. I’d never imagined that the real thing would be so disappointing. Either I had a defective bottle, or the google swatches were misleading. I love Zoya and this color is amazing!